The SUSORGPLUS project will develop smart and low energy input processing chains, natural food additives and colourants, and supportive material for a code of practice to increase sustainability and consumer acceptance of organic food stuffs. Consumers expect organic food to be of superior quality and sustainably produced. Organic food processing is characterised by empirical approaches resulting in high specific raw material and energy demands as well as product deterioration, thus, impacting on overall sustainability and product quality. Steps towards mitigation have been taken (e.g. in Core Organic Plus) but there is still a lack of a clear Code of Practice. Restrictions in the usage of additives and the need of phasing out contentious materials further increase pressure whilst the full potential of natural additives and colourants is not explored. The CORE Organic Cofund project SusOrgPlus will address these issues for the processing and production of value added products of selected plant and animal origin through the development of novel, smart processes, natural additives/colourants and supporting material for a Code of Practice. 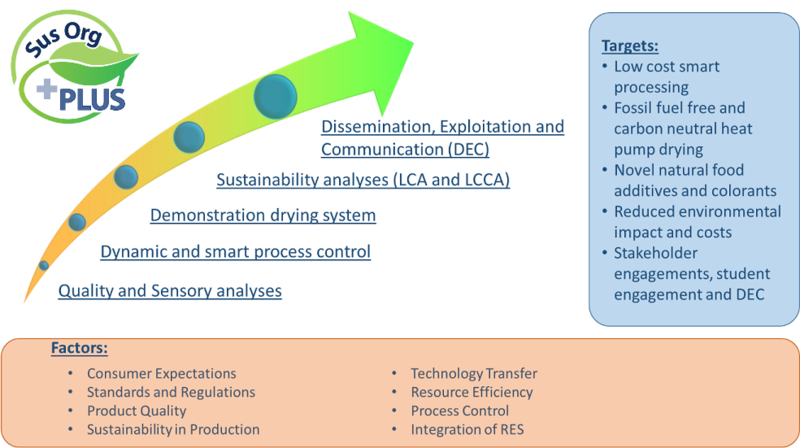 Inclusion of leading food scientists, process-, mechanical and control engineers, agriculturalist and a technology provider and utilisation of a stakeholder-guided approach will assure that all relevant aspects for the development of smart, efficient and low energy input processes and value added products are adequately addressed. The geographical balance, with participants from Central, Eastern, Northern and Southern Europe, will assure the relevance of the project across the EU and beyond. SusOrgPlus will provide the organic sector with smart processing technologies, value added products (natural additives/colourants) for phasing out contentious substances, increased process efficiency, reduced specific resource demands and strategies for phasing out fossil energy use. Further, the project will contribute to the reduction of direct waste and by utilising and upgrading of produce rejected by the fresh produce market. A sound data base will be provided as well as LCA and LCCA analyses for the processes and selected products which will help the bench marking of the production.